Setting The Pick (139/365 v2.0) – Annoyingly Boring? 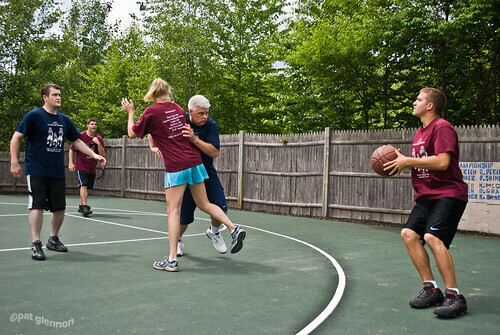 Neighborhood 3-on-3 basketball tournament Saturday. 10 teams involved. Sadly my team was done early after two losses. The eventual champions in maroon take on one of the other top teams in navy blue. The maroon had the only woman in the tourney. A hell of a player to be sure and not afraid to mix it up with the boys. A good time was had by all and perhaps most importantly, no injuries to report. It was a bit of a wake up call for me though as I am still woefully out of shape. All the beer and burgers and sausage afterward was sure to help on that front though! Jenny’s strategy of kneeing old men in the crotch, while technically illegal, proved highly effective. It’s good to go out in the early rounds–so you can start drinking sooner. .-= Ed´s last blog ..Blends =-.